Robots do not have to breathe. For this reason they can dive longer than any human. Equipped with the necessary sensor technology they inspect docks or venture down to the ocean floor to search for raw materials. At present, researchers are developing a model which will carry out routine tasks independently, without help from humans. Even when equipped with compressed-air bottles and diving regulators, humans reach their limits very quickly under water. In contrast, unmanned submarine vehicles that are connected by cable to the control center permit long and deep dives. Today remote-controlled diving robots are used for research, inspection and maintenance work. The possible applications of this technology are limited, however, by the length of the cable and the instinct of the navigator. No wonder that researchers are working on autonomous underwater robots which orient themselves under water and carry out jobs without any help from humans. In the meantime, there are AUVs (autonomous underwater vehicles) which collect data independently or take samples before they return to the starting points. “For the time being, the technology is too expensive to carry out routine work, such as inspections of bulkheads, dams or ships’ bellies,” explains Dr. Thomas Rauschenbach, Director of the Application Center System Technology AST Ilmenau, Germany at the Fraunhofer Institute for Optronics, System Technologies and Image Exploitation IOSB. This may change soon. Together with the researchers at four Fraunhofer Institutes, Rauschenbach’s team is presently working on a generation of autonomous underwater robots which will be smaller, more robust and cheaper than the previous models. The AUVs shall be able to find their bearings in clear mountain reservoirs equally well as in turbid harbor water. They will be suitable for work on the floor of the deep sea as well as for inspections of shallow concrete bases that offshore wind power station have been mounted on. 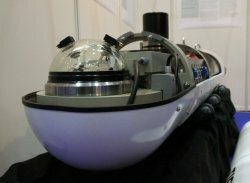 The engineers from Fraunhofer Institute for Optronics, System Technologies and Image Exploitation in Karlsruhe, Germany are working on the “eyes” for underwater robots. Optical perception is based on a special exposure and analysis technology which even permits orientation in turbid water as well. First of all, it determines the distance to the object, and then the camera emits a laser impulse which is reflected by the object, such as a wall. Microseconds before the reflected light flash arrives, the camera opens the aperture and the sensors capture the incident light pulses. At the Ilmenau branch of the Fraunhofer Institute for Optronics, System Technologies and Image Exploitation, Rauschenbach‘s team is developing the “brain“ of the robot: a control program that keeps the AUV on course in currents such as at a certain distance to the wall that is to be examined. The Fraunhofer Institute for Biomedical Engineering IBMT in St. Ingbert provides the silicone encapsulation for the pressure-tolerant construction of electronic circuits as well as the “ears” of the new robot: ultrasound sensors permit the inspection of objects. Contrary to the previously conventional sonar technology, researchers are now using high-frequency sound waves which are reflected by the obstacles and registered by the sensor. The powerful but lightweight lithium batteries of the Fraunhofer ISIT in Itzehoe that supply the AUV with energy are encapsulated by silicone. A special energy management system that researchers at the Fraunhofer Institute for Environmental, Safety and Energy Technology UMSICHT in Oberhausen, Germany have developed saves power and ensures that the data are saved in emergencies before the robot runs out of energy and has to surface. A torpedo-shaped prototype two meters long that is equipped with eyes, ears, a brain, a motor and batteries will go on its maiden voyage this year in a new tank in Ilmenau. The tank is only three meters deep, but “that’s enough to test the decisive functions,” affirms Dr. Rauschenbach. In autumn 2011, the autonomous diving robot will put to sea for the first time from the research vessel POSEIDON: Several dives up to a depth of 6,000 meters have been planned.